Some of the world’s free & paid TV channels where we supply content regularly are Mauritius Broadcast Television, Malaysia Telecom, Sri Lanka TV and many more. We acquire South Indian films dubbed in Hindi & other North Indian languages and syndicate them to electronic and digital media. We also aggregate negatives of films and syndicate content. 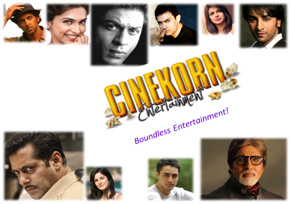 With more than 500 screens exhibiting Bollywood films globally, Cinekorn Entertainment has a strong network in exhibition & theatrical circuits. We are proud of our strong relationship with terrestrial networks, cable networks, IPTV & internet players. Our distribution network is also present in non ethnic markets such as Germany, Poland, Russia, Thailand and many more. We're entering the relatively virgin media & entertainment market in Africa with African Media & Entertainment Corp [AMEC]. AMEC will be a vertically integrated, innovative & dynamic conglomerate which aims to have a pan African presence in the Media & Entertainment space. AMEC is the holding company of TAMC – The African Movie Company, ACC – African Content Company and ABC – African Broadcast Corporation.